Notes for the Lancaster Aircraft, AVRO Type '683' MK.I & II. Published by A.V.Roe & Co. Ltd., Manchester, March 1943. Card covers, 15 x 23cm. Approximately 66p plus 20 pullout diagram/charts at the back. 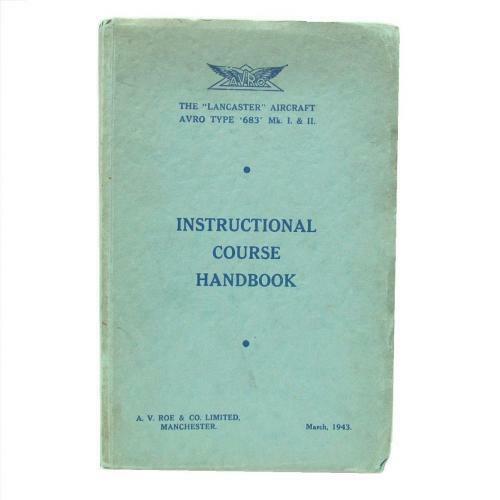 Subjects covered include the fuselage, flying controls, engine and secondary controls, hydraulic system, gun turret hydraulic system, electrics, wireless equipment, bomb gear, compasses etc. The diagrams include the instrument panel, hydraulics, fuel system, turret hydraulics etc. Each copy was marked as 'Confidential', covered by the official secrets act and had an individual reference number, 2571 in this case. The cover is a bit grubby, creased and dog-eared at the edges. The pages are good whilst the diagrams have some folded/creased edges and minor tears. Good used condition overall. Rarer early version of this excellent reference material. Stock code P21362.